As a fan of Disney Animation and Pixar Studio products, I was interested in going behind the curtain to see how the wizards did their magic. I was especially interested to see how a creative organization manages the mundane business side of finance and teamwork. Ed Catmull accomplished this in providing a glimpse into building a creative business that works with limited budgets, highly individual and often idiosyncratic creative employees, and critical deadlines. Non-creatives sometimes fail to see that creativity and art often require more hard work and skill development than natural talent. This book reveals the perspiration that accompanies inspiration and, sometimes, a little luck. Catmull describes the creative challenges and solutions to some of Pixar’s beloved works and how, sometimes, the stories we see on the screen are far different from what was first imagined. I recommended the book to my daughter who is studying animation so she can see how Pixar approaches story development, professional reviews of works in progress, and the difficult task of changing something you have put a lot of time into (killing your darlings) in order to make great art. The book also provides insight into teamwork strategies and building a business. Catmull provides a look at the operation and interrelation of diverse management personalities such as his more reserved style and the dynamic aggressive style of Steve Jobs. Though their personalities were different, they were able to synergize so that the best of both were infused into the corporate culture and both seemed to rub off a bit on the other. The other management characters within Pixar are discussed including their valuable contributions to the company’s success. Not forgotten are the many Pixar employees whose dedication to creating a high quality product that Catmull praises throughout the book. If you are a creative in any industry, you will gain a lot from the wisdom shared in this book. If you are trying to develop a team or a corporate culture, you will also find much to inspire and educate you in this book. If you are saving money for that special Walt Disney World trip, you want to have the best trip possible. For WDW that means planning. Sometimes small enhancements to your plans can maximize your fun and make a trip to remember forever. Poor planning can often lead to unnecessary waiting, discomfort, and wasted time. Here are the secrets learned from more trips than I can count. This site is dedicated to Chuck and Imelda – the best host and hostess in the World. Water bottles. You can refill them in the park. Medical discomfort kit. Asprin/Ibuprofen (headache from heat etc), anti-diarrheal, anti-itch/allergy (benadryl); band-aids, sunscreen; anti-nausea. Snacks. Carry some cereal or energy bars, pretzels, or other snack items to curb hunger between meals and kick up your blood sugar when you are getting tired (and possibly grumpy–Grumpy is ok if you’re the dwarf, not if you are a park guest). It is ok to take these into WDW. Comfortable footwear is the key. Hard sole shoes invite discomfort and dissatisfaction. I am always surprised to see women walking around in heels and dress shoes. Don’t wear sandals unless you are sure that you will be able to spend over 8 hours standing and walking on a hard surface (asphalt and concrete). If you are concerned about the water rides, consider taking your shoes off during the ride and protecting them with a bag. You will crossing back and forth across the parks more than you think and the journey to and from the parking lot (even with the tram) will challenge your foot comfort. Break up large groups When travelling with a large group just arrange time/place to eat (or picnic) then take the “you all have cell phones – let’s keep in touch” approach because you will waste time and add frustration trying to get everyone to agree on what to see (“Billy really doesn’t like that.”, “That seems too scary/rough/childish for Mary.” It’s not about the rides, it’s about enjoying the place and having to coordinate activities with a big group. Break up into smaller groups (preferably divided by ride intensity preference). Relax Part 1 Disney is a popular vacation destination and is in Florida therefore crowds and seasonal heat are part of the experience. Accept this and you will be much happier. I am often bemused by people complaining about the heat and crowds and think to myself, “did they know where they were going?” If you have to travel during the hot season, follow the hydration and cooling tips on this site. Relax Part 2 Try not to lose your temper. It’s the happiest place on earth for crying out loud. I hear parents and grandparents snapping at the young people with them about the dumbest things. If you want to have the expense for the trip to yield a dividend of lasting memories, don’t blow it by going off on your kids. Do the “count to 10,” deep breaths, whatever it takes to get in control. Maybe it is the effects of how long you’ve been at the park, length of the trip, weather, or other factors but you will be much happier if you check yourself and calmly talk with your kids/grandkids. The adults need to work out something that helps them get along as well. I hear them snap at each other about minor inconveniences. Here, more than anywhere, bite your tongue, focus on the spirit of the place and the sights, and either calmly address the issue or let it go. Make generous use of spray and water zones. Some people like to leave the park mid-day to go rest. I’ve never understood this. There are quiet and dark rides where you can catch a small nap. In Magic Kingdom, The Tomorrowland Transit Authority is a quiet covered ride that travels through darker parts of the Tommorowland attractions. When the kids would get tired, we’d take them on that and lure them into a nap. If the crowds are not large (and for TTA they are usually not), you can ask them to let you stay on the ride. We’ve gone through 3 or 4 times with the kids napping. 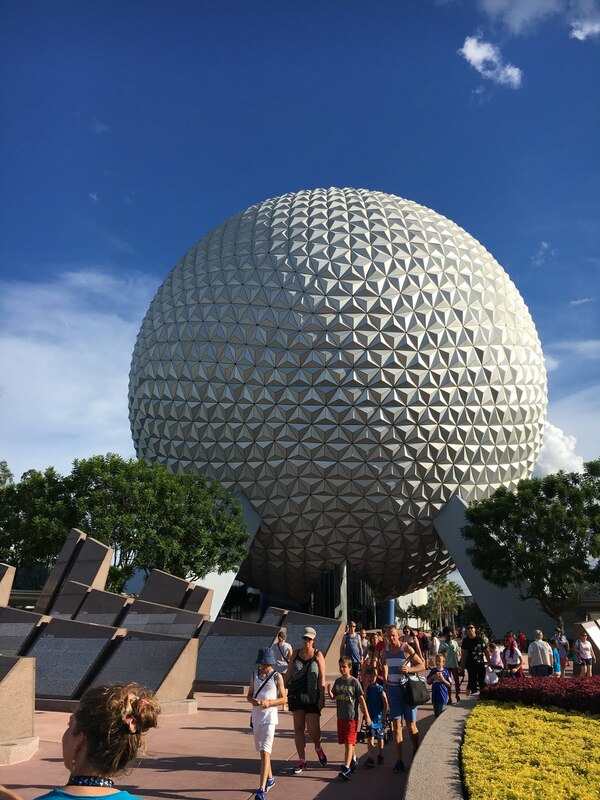 Consider riding Spaceship Earth in Epcot, The Great Movie Ride at Disney’s Hollywood Studios, and It’s Tough to Be A Bug at Animal Kingdom to get some rest and cool down. Don’t forget to refill your water bottles in your backpack! Do not join the herd. First, learn the FastPass system and update your knowledge before your trip as Disney is constantly tweaking the system. People tend to go to the most popular rides and work from front to back. Always look for the line that no one is taking. Some rides have two line queues but people migrate to the right. If in doubt, ask a cast member discreetly (so you can get ahead of the drones who will follow you). At Magic Kingdom, I would suggest getting there early and either taking the train to Frontierland in the back of the park (or Tomorrowland and Mickey’s ToonTown) and working your way around. Most people tend to work up Main Street then the ones with kids go straight under the castle to Fantasyland. As you can imagine, the lines for this “kiddie” area is crowded in the AM as the crowds follow this pattern. Later in the day, the crowd thins in that area. Ask the cast members about crowd levels and waiting times for the period that you are there. They are pretty good about giving you and idea of what are reasonable wait times. We have seen 1-1.5 hour waits for some rides, such as Thunder Mountain and Splash Mountain, then walked in with little or no wait during the last couple of hours before the park closed. Same for Spaceship Earth: you can generally walk right on in the hour before the park closes. Use an app that will provide ride times. MyDisneyExperience, made by Disney, is good but, as an Undercover Tourist fan, I prefer their app. Do Advanced Planning. Make special meal reservations in advance. You can make meal reservations about 180 days before your visit which is VERY important if you want to have a character meal [the characters come by the table and entertain the guests]. If the kids are into Pooh Bear, breakfast at the Crystal Palace in MK is good; for Mickey and friends it is hard to beat Chef Mickey’s in the Contemporary Hotel (a monorail ride from MK). The character meals are a nice treat for the kids. You may make reservations online at or by calling (407) WDW-DINE or (407) 939-3463. You can also make reservations at the park at Guest Relations. Visit one of the many fan sites like Intercot and MiceChat with ideas to improve your trip but be careful about overplanning. Netflix has some special Disney produced vacation planning videos available for instant download. Also, Disney will send you a free planning video (request on their site). Lighten your load. If there is a significant chance of rain, bring ponchos and a change of clothes and store them in a locker instead of carrying them around all day. If you are shopping early in the day you can send purchases to the front gate and pick them up when you leave. If you are staying at a Disney resort you can send your purchases to your room!